John Dore is an Associate Research Professor in the Department of Land Resources and Environmental Science at Montana State University. His field of research for SALSA is Geobiology and Biogeochemistry. John at Lake Waiau, Hawaii, in January 2005. Lake Waiau lies high (3,970 meters) upon the dormant volcano Mauna Kea. After getting his Ph.D., he spent the next 12 years going back and forth between academic research and scientific management positions in the budding microalgae industry. Along the way, he married his college sweetheart, Missey, and together they raised their two children, Helena and Calvin, in the small town of Waimea on the Big Island of Hawaii. Eventually, John and his family moved back to the mainland and settled upon Bozeman, Montana, and traded scuba gear for skis. Having worked briefly as a postdoc with John Priscu, John enlisted his help in obtaining a position as Associate Research Professor at Montana State University. He has been raising support for his research through grants and contracts for the past 11 years. John has many research interests, but is mainly focused on biogeochemistry, geobiology and microbial ecology. He is fascinated with how microbes manage to survive in low-energy and/or low-nutrient environments, including the open ocean, ice-covered lakes, deep-sea sediments and subglacial systems. He also has a particular interest in microbial production and consumption of greenhouse gases – carbon dioxide, methane and nitrous oxide – amidst a changing global climate. John at Ross Island, Antarctica, in December 2018. Over the hill from McMurdo Station and near Scott Base, these pressure ridges form where the sea ice meets the ice sheet and the land. The active volcano Mt. Erebus is in the background. 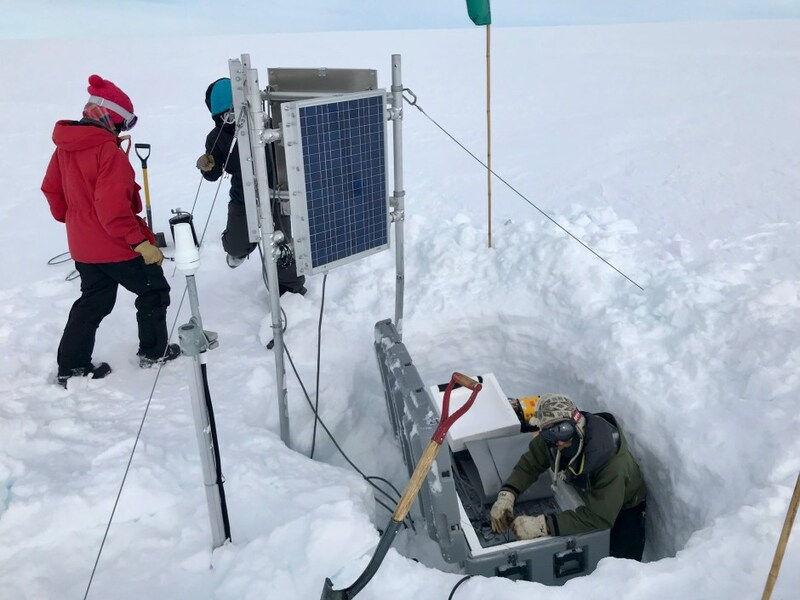 John’s role as a co-Principal Investigator in SALSA is primarily to support the collection and analysis of sediment cores from the bottom of Subglacial Lake Mercer, and to help interpret the geochemical data generated. In the field, John worked with SALSA’s sediment team to obtain intact, uncontaminated core samples. In the lab, he mainly worked on measuring methane and its stable isotopic composition to better understand the sources of this energetic greenhouse gas, its role in supporting the lake ecosystem, and the potential for its release to the atmosphere during times of deglaciation and ice sheet retreat. John at Anvers Island, Antarctica, in February 1991. Polar Duke and Palmer Station are in the background. In 1995, John joined Dr. Priscu and a hardy team of Bozemanites for Winfly, a late winter deployment in the McMurdo Dry Valleys to study the influence of the transition from polar night to day on lake ecosystems. Coming directly from Hawaii, he says that the extreme cold, darkness, and lack of visible life were a shock for him. “I had never realized how difficult it could be just to function or to get anything mechanical to work at -40 degrees,” he says, “but good company and unique science made the two months of hardship all worthwhile.” His most recent trip with SALSA was his 6th trip to Antarctica, 23 years after his last polar journey.